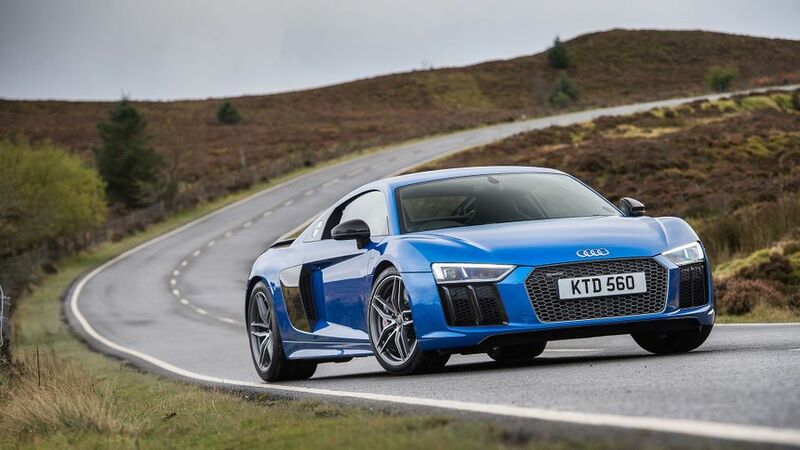 We road test the fastest, most powerful road car Audi has ever built, the 601bhp and 205mph new Audi R8 V10 Plus, in the UK and deliver our official verdict. Audi defied all expectations with the original R8, and while this new car is more evolution than revolution, almost all the changes are positive ones. The howling V10 engine still takes centre stage, but the handling is just as keen, adjustable and engaging as before. The interior is now as plush and packed with technology, and while it doesn't quite steer with the same scalpel-like precision of a 911, the R8 sounds and feels a lot more dramatic, while still being remarkably easy to live with. 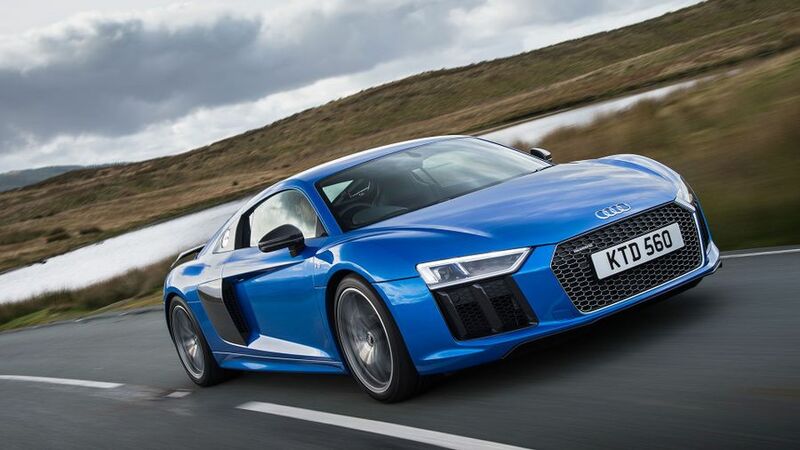 Interested in buying an Audi R8? Cars as expensive as the R8 need to make an impact. The original coupe blurred the lines between sports car and supercar and turned heads wherever it went, but it was certainly a car for extroverts, unlike the iconic, but arguably more conservative Porsche 911. This new R8 is still a striking looking thing, but the gorgeous 'side-blade' vents from the original have been toned down. The squared-off headlights and deep grille show a stronger resemblance to the rest of the Audi range. The standard V10 model comes with 19-inch alloys, a silver finish on the side vents, a retractable rear spoiler, LED headlights and twin exhausts. Step up to the V10 Plus and you get a different set of alloys, a big fixed rear spoiler and a lot of carbon fibre trim, with this exotic material covering the vents, mirrors, splitter and diffuser. There are nine standard paint colours, with the Ara Blue in our pictures and Vegas Yellow the most striking, but you can add any shade you want as an optional extra. Other visual trinkets on the options list include 20-inch wheels, and carbon fibre trim for the engine bay. Some buyers might perhaps think the styling has gone backwards, but we'd argue that the change was worth it, because the interior is miles better than what came before. Audi set the template for this cabin when it designed the latest TT - and the flagship uses the same 'virtual cockpit' - with a 12.3-inch display replacing the conventional dials. This screen combines a large rev counter and speedo with the controls for everything from the radio station to the sat-nav. Switching between the different views and menus is all done through the steering wheel controls, and while it takes getting used to, it soon becomes intuitive. You sit very low in the car, but visibility is excellent for a car of this type, with a clear view ahead and a decent rear window, so it's easy to judge the R8's dimensions when driving on narrow roads. It goes without saying, but the materials are also top notch, and it feels beautifully put together. As standard the front seats are electrically adjustable, so finding the right driving position is child's play, which is not the case in rivals such as the Mercedes AMG GT. Audi has stuck with a mid-engined layout for the latest R8, and while the V10 engine looks gorgeous slung across the centre of the car, it rules out any chance of having rear seats. In fairness, the only rival to offer the convenience of back seats is the Porsche 911, but there's no denying the extra versatility they bring. Still, the R8 makes the most of the space it does have, with a shallow boot large enough for a couple of soft weekend bags in the nose and a large shelf behind the front seats onto which you can (just about) squeeze a set of golf clubs. Inside the cabin things are certainly snug, but there are a few useful cubbies, a reasonable glovebox and a deep tray for holding your phone, but that's your lot. The larger Mercedes AMG GT has a bigger, more versatile boot, but if practicality is really your main concern then perhaps a two-seat sports car might perhaps not be the best choice in the first place. 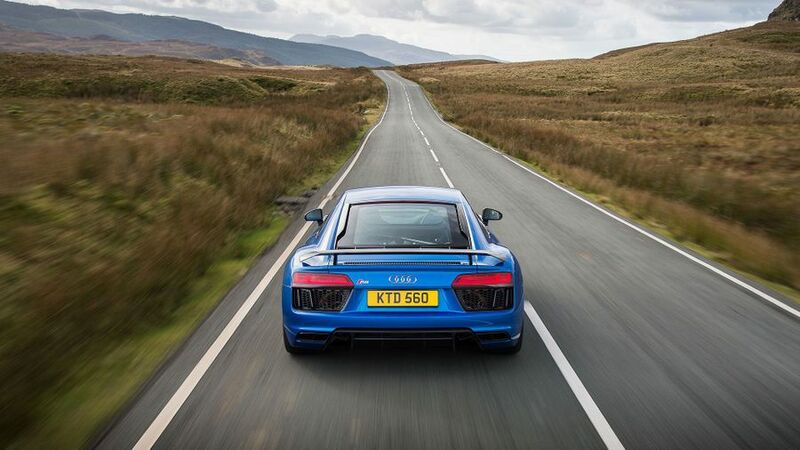 The wonderful thing about the R8 is that it still gives drivers the best of both worlds. It feels exhilarating to drive, with quick steering and finely poised handling, darting into corners with just a flick of your wrists. The latest car has a stiffer chassis and lowered suspension, so it'll still give you thrills like the best sports cars should. Yet all this excitement doesn't come at the expense of comfort or driveability, thanks to the standard four-wheel drive system. You can drive the R8 in all conditions without feeling intimidated, as it feels planted and secure at all times, generating huge amounts of grip. The steering is a touch more remote than it was in the old car, and the optional 'Dynamic' system can make the weighting feel a little unnatural through corners, but that's the only blot on the R8's otherwise faultless dynamic repertoire. Our test car came on the optional adaptive dampers, which do a fantastic job of smoothing out lumpy surfaces, and you can take speed bumps without the fear of scraping the nose. This supple setup - combined with the huge grip - makes the R8 perfect for UK roads, but if you do want to have fun, you can easily adjust your line through bends by experimenting with the throttle. Where almost all of its closest rivals have downsized, or fitted turbochargers, Audi has stuck with an enormous, naturally-aspirated engine for the R8, and it's an absolute masterpiece. The 5.2-litre V10 comes with 535bhp in standard trim, but that figure rises to a Lamborghini Huracan baiting 601bhp if you choose the V10 Plus model. We've only driven the latter so far, but it bellows its intentions as soon as you press the bright red starter button on the steering wheel. Yet, leave the seven-speed automatic gearbox in auto and tickle the throttle when pulling away, and it's as smooth and simple to drive as a 1.4-litre Audi A1. Cycle up the driving modes, though, and push the button for the sports exhaust, and all hell breaks loose. The surge of acceleration is almost overwhelming, the noise is savage and the auto' 'box shifts through the gears in the blink of an eye. The Plus dispatches the 0-62mph sprint in just 3.2 seconds, and tops out at 205mph, making it both the fastest and most powerful production car Audi has ever built. When you're not having fun, though, the R8 will happily pootle along without complaint, and only the roar from the wide tyres and the looks from passers by remind you that you're driving something so spectacularly fast. It's hard not to be seduced by the sharp responses and thunderous sound of the V10, but there is no escaping the harsh financial realities associated with big displacement. A Porsche 911 Turbo or Mercedes AMG GT S will return close to 30mpg when coaxed, but the official figure for the R8 V10 is 24.8mpg, or just 23mpg for the even more powerful V10 Plus. It does come with start/stop as standard, but still emits between 272 - 287g/km of CO2, putting it in the top bracket for Vehicle Excise Duty (VED) and first-year showroom tax. Now we do accept that most potential R8 buyers are unlikely to have one eye on their monthly fuel bill, but the juicy nature of this engine does have an impact on driving range, so you'll have to stop more often on longer trips. Replacement tyres, insurance and other running costs will be similarly punishing, although the V10 Plus does come with fade-free carbon ceramic brakes as standard, which should need replacing far less often than their steel equivalents. Most of the R8's competition costs more to buy, and the Audi is predicted to have stronger residual values, so while the depreciation is a factor, it should be a solid investment. A large slice of the appeal of the previous R8 was its genuine accessibility and cult status as an 'everyday' supercar. 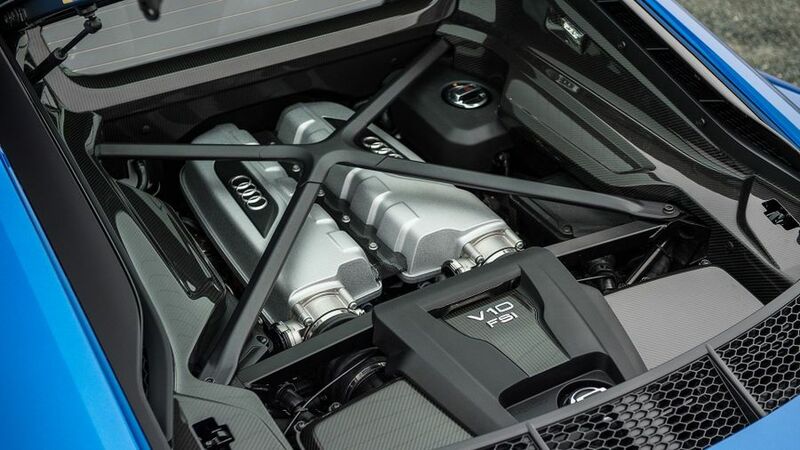 That reputation was built upon a solid reputation for reliability, so it bodes well for this model that the V10 engine, and most of the chassis parts, are carried over this time around. There were things that did go wrong, with a recall for a minor heating issues, and problems with the air-conditioning compressor that could only be repaired once the engine had been taken out. However, the major mechanical bits are well proven for their durability. 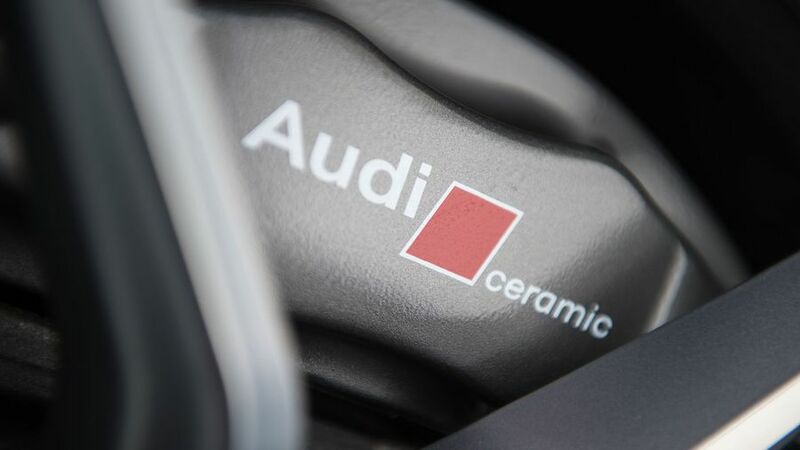 Audi in general doesn't rank all that well for reliability, as the brand occupies a fairly lowly position in the Warranty Direct Reliability Index, with a lot of owners complaining about the cost and frequency of repairs. However, the R8 is subject to more rigorous care and attention than rank and file models, and as standard the R8 has a three-year warranty, covering the first 60,000 miles of motoring. On the plus side, you can pay out a little extra for four- or five-year coverage to put your mind further at ease if you plan on keeping it for that long. Security is almost as important as safety when it comes to cars like this, as they're a prime target for thieves. Fortunately the R8 comes with an anti-theft alarm, engine immobiliser and preparation for a tracking device (although if you want a tracker, you'll need to fit it yourself). The rest of the safety equipment on offer is standard fare, with four airbags to protect the two occupants, ISOFIX mounting points on the passenger seat, and the usual suite of electronic aids including stability control, slip control and anti-lock brakes. The R8 does without fancier kit like adaptive cruise control, lane departure warning or autonomous emergency braking, and in fact, even basic cruise control is not fitted as standard. Obviously given its high price and low volume of sales, the R8 will not be taking the Euro NCAP crash tests any time soon, but because it misses out on the latest technology, we'd expect it would probably score four, rather than the full five stars. With a simple trim structure divided between the two power outputs, picking your perfect R8 should be quite a simple task. The standard car gets leather, electrically adjustable heated seats, sat-nav, DAB radio, Bluetooth, front and rear parking sensors, climate control and the 12.3-inch Virtual Cockpit display. Splash out around the cost of a new Ford Fiesta for the V10 Plus, and you get carbon trim in the cabin, grippy bucket seats, stainless steel pedals, extra buttons on the steering wheel for the sports exhaust and the flashier exterior we mentioned earlier. On the down side, there are some essentials that we'd recommend adding as options, which should probably be included as standard on a car that costs over £100,000. Cruise control, for example, along with a reversing camera, the storage pack (which amounts to a few nets) and a set of adaptive dampers. The optional Bang & Olufsen speakers sound great, but they're fairly costly. We'd avoid the variable ratio dynamic steering, as it detracts from the driving experience. The new Audi R8 is every bit as intoxicating to drive as its predecessor, but now even easier to live with, thanks to its stunning, spacious cabin, supple ride and surprising refinement. Its V10 engine, lightning fast automatic gearbox and surefooted four-wheel drive system all make it easy and exciting to drive at any speed, and only the poor fuel economy and limited practicality stop it from being the perfect everyday supercar. Strongly recommended.